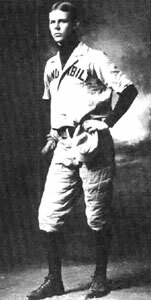 Grantland Rice as Vanderbilt baseball captain, 1901. Rice moved to Nashville with his family and soon acquired a lifelong love of the outdoors and sports. He entered Vanderbilt University in the fall of 1897, after prepping at Wallace School. A good athlete, the slender (6’2″, 135 pounds) Rice played end on the college football squad and shortstop on the baseball team. Baseball was his best sport, and in recognition of his outstanding abilities, he was named varsity captain during his senior year. A scholar as well as an athlete, Rice excelled in his favorite courses: English literature, Latin, and Greek. His grades earned him membership in Phi Beta Kappa. Rice briefly aspired to a professional baseball career, which both his father, Bolling Rice, and grandfather opposed. In the mid-summer of 1901, Rice accepted a position at the Nashville Daily News, writing sports and covering the State Capitol and the Davidson County Courthouse. In 1902 Rice moved to the Atlanta Journal as sports editor. There he became an associate of Don Marquis, Frank Stanton, and Joel Chandler Harris. He also met his future wife, Kate Hollis of Americus, Georgia. They married in 1906, and were the parents of one daughter, Florence. Rice left Atlanta in 1907 to join the Nashville Tennessean, a fledgling newspaper impressively launched by Luke Lea. Owner-publisher Lea paid Rice the then princely salary of seventy dollars a week to write and edit sports and contribute a column to the editorial page called “Tennessee ‘Uns,” a daily potpourri that usually contained a verse or two. Rice typically worked twelve- to fourteen-hour days producing copy for the Tennessean sports pages; when he filled in as theater critic, the work days were even longer. Undoubtedly this schedule, which left little time for his family, was a factor in Rice’s decision, late in 1910, to take a substantial pay cut and accept a job with the New York Evening Mail. Perhaps another factor in the move was the Evening Mail’s reputation for building circulation by accentuating the paper’s columnists. Veteran columnists Franklin P. Adams and Rube Goldberg hailed the addition of Rice to the staff. Rice’s columns on the Giants’ manager John McGraw, pitching ace Christy Mathewson, and teenage golf sensation Bobby Jones quickly created a loyal New York following. In January 1914 the New York Tribune used a full-page ad to announce the addition of the talented Grantland Rice to the sports staff. When the United States entered World War I, the thirty-eight-year-old Rice enlisted as an army private. He spent fourteen months in military service, mostly in France and Germany. When he was mustered out in the spring of 1919, Rice returned to New York to resume his journalistic career. Besides his daily column, which was syndicated in eighty to a hundred newspapers, Rice edited American Golfer magazine and contributed to Collier’s and Look. He helped pick college football’s All-America teams and narrated the weekly Sportlight films. Rice’s talent earned him the friendship and respect of well-known members of his craft including Ring Lardner, Heywood Broun, Damon Runyon, W. O. McGeehan, and Rex Beach; he also authored several books of poems. Sports and poetry seemed to blend perfectly for Rice, who observed that “Rhythm, the main factor in both, is the main factor in life itself.” His most enduring and oft-quoted stanza was: “For when the one Great Scorer comes to write against your name, He marks–not that you won or lost–but how you played the game.” Grantland Rice died in 1954.